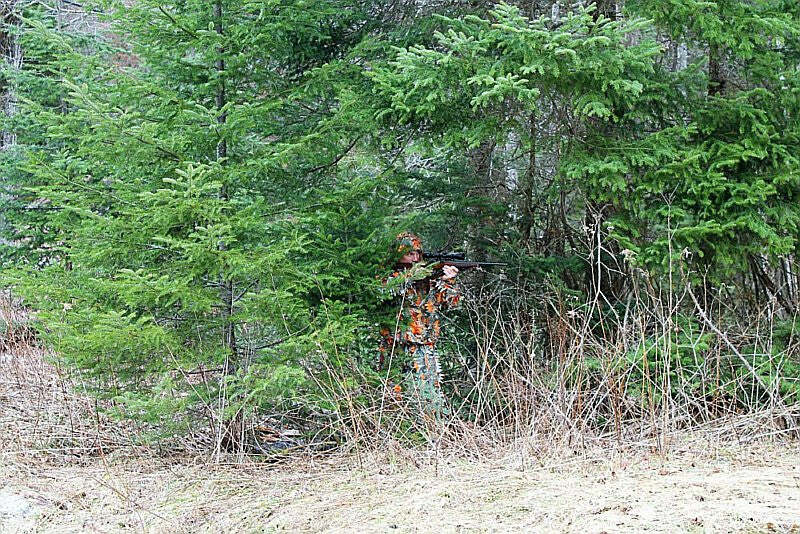 The patented See3D™ 3D Leafy blaze orange camouflage suit is a lightweight, camo suit that is made for someone who wants a light, compact, quick on the go suit. Quick to put on and off, it allows you gain instant camouflage AND visibility when you arrive at your hunting location. Sometimes called a "Ghillie" suit, the See3D™ uses laser-cut "leaves" that are attached to a base mesh to achieve a 3rd dimension. The "3D leaves" move independently and break up the hunter's outline much more effectively than traditional camouflage. 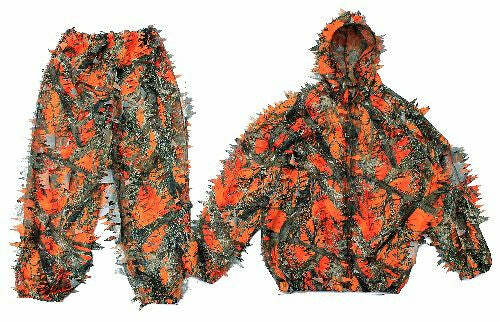 By itself or layered, the See3D™ 3D Leafy blaze orange camouflage suit is ready for hunting in any conditions you might encounter. This lightweight 3d camo suit is a two piece jacket and pants suit with a full front zipper and attached hood. It packs down to a small size and fits easily into a small backpack allowing you to put it on only when you need it. 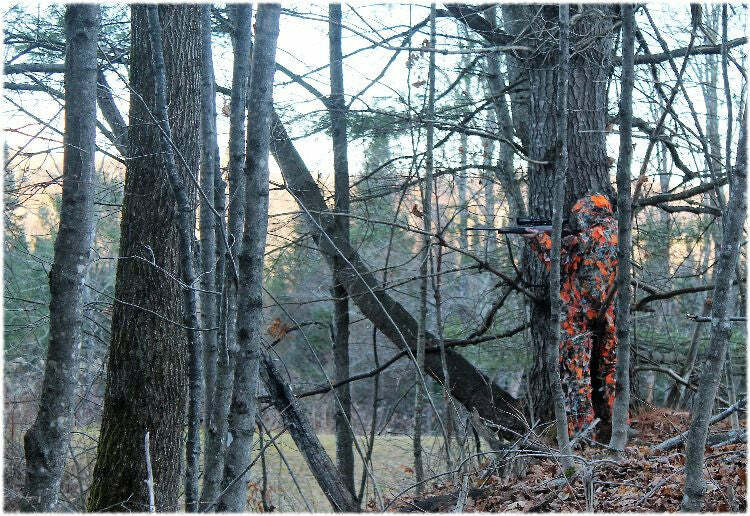 The underlying pattern for the suit and 3D leaves is a safety blaze orange making you highly visible to other hunters while still invisible to deer. The jacket of our 3D leaf suit is designed to have 30% orange which means about 520 square inches total. This meets orange safety requirements of over 35 states. Find out if it meets the orange requirements in your state. The leaf cuts are larger and more realistic than other 3D suits to improve its 3D depth and camouflage. With a jacket and Pants set you have flexibility. Jacket comes with attached hood and a full front zipper. The pants have an elastic waist with a drawstring. As a fully licensed manufacturer of Truetimber patterns, our suit uses the proven "MC2 Blaze Orange" pattern developed to match many terrains. At See3D™ we have developed technology that allows us to take and view photos of what deer see. To our knowledge, it is the most accurate representation of deer vision to date. As you can see from the Deer Vision photos, with human vision the hunter is clearly visible at 100 yards, the distance from which the photo was taken. Slide the bar to the left and you will uncover Deer Vision. As an animal with dichromatic protanopia, deer have a severe form of red-green color blindness, in which there is impairment in perception of very long wavelengths, such as reds. In fact the green leaves of the trees AND the orange of our suit are BOTH perceived as various shades of yellow and grey. 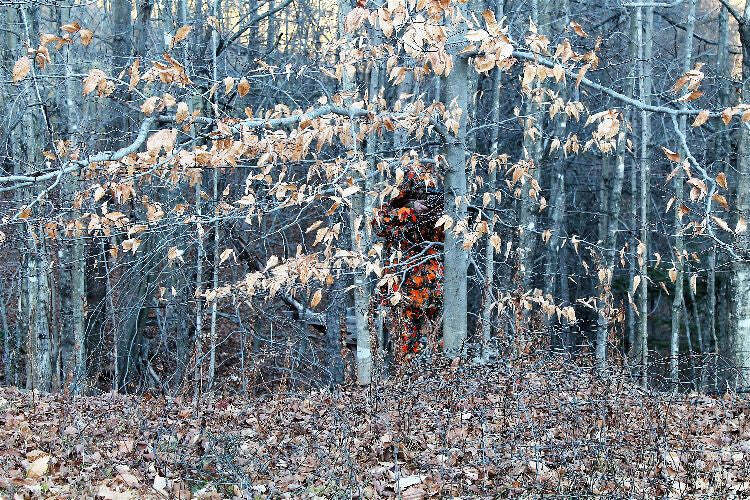 To deer, hunters wearing a See3D blaze orange camo suit blend seamlessly into their surroundings, making them invisible to deer. Yet to human vision, the hunter wearing a See3D suit stands out making the hunter highly visible for safety.